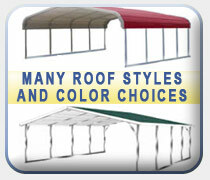 At Coast To Coast Carports, we have the perfect metal barn roofs design and styles to fit your needs and wants. 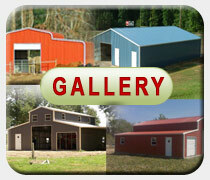 With our amazing selection on inventory choices, you will be able to make your dream barn become a reality. We have incredibly fast lead-time from the time you order to the time that you can enjoy your completed product. We take pride in our customers and want them to feel like they are getting the service and quality that they deserve at the prices that they can afford. We let our customers choose which style of roof they desire from a regular rolled corner style to an A-Frame style. The choice is yours. We also let our customers choose from a variety of standard features such as the gauge of steel, anchor style, trim design, and so much more. We also let you choose from one or a few of our twelve color choices to make your metal barn roofing and sides the color and style you want. We also offer 7 different accessories and add-on features such as extra panels to lengthen or widen your design, garage doors, or walk-in doors to allow for easy access, etc. 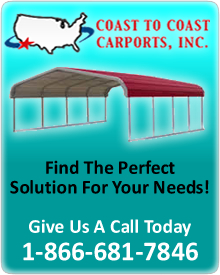 At Coast To Coast Carports, your possibilities are endless. We have hired the most professional and experienced installers that you will find to quickly and professionally build and install your new barn. They will install everything from the side frames, accessories, to the metal barn roof. You will love working side by side with the most friendly, courteous, professional team of qualified customer service agents and reps throughout the U.S. and Canada. We offer amazing metal barn roofs service coast to coast and would love to help you get started on designing and building your dream barn today! 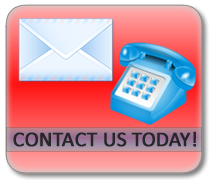 Please give us a call today for a free quote.